Do you like a good coleslaw? We sure do in our family. Toss pecans in a dry frying pan, over medium heat, stirring until lightly toasted. Set aside. Combine all ingredients except pecans in a glass bowl so the pretty colours show through. 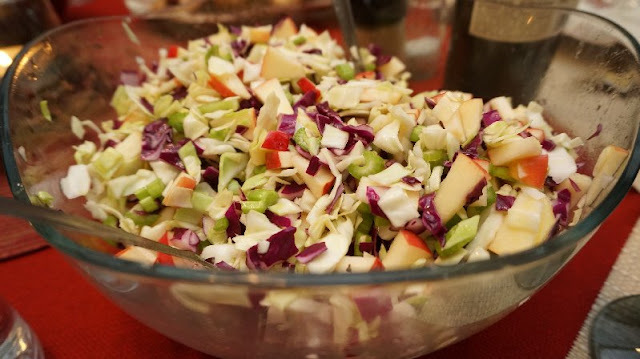 Mix dressing until emulsified and pour just enough over coleslaw to coat the ingredients. Just before serving, add pecans and toss again. What happened to the good kitchen utensil hints on Saturdays? Hi LInda! Thank you for letting us know that you appreciate the Saturday posts. Not to make anyone feel bad, but just so our readers know, we lead pretty regular and sometimes unpredictable lives, Bev signed up for this Saturday quite a while back, not knowing that she'd be sitting by the bedside of her father all week. I'm guessing she did not have time to do what she originally planned and did not want to bother any of the rest of us. I think you'll understand. Wishing you a good day. Dried cranberries would be a great ingredient also, or even mandarin oranges! I am liking this recipe! Waldorf salads are my favourites and this one sounds wonderful. I just read Anneliese's note and will keep you in my prayers dear Bev!